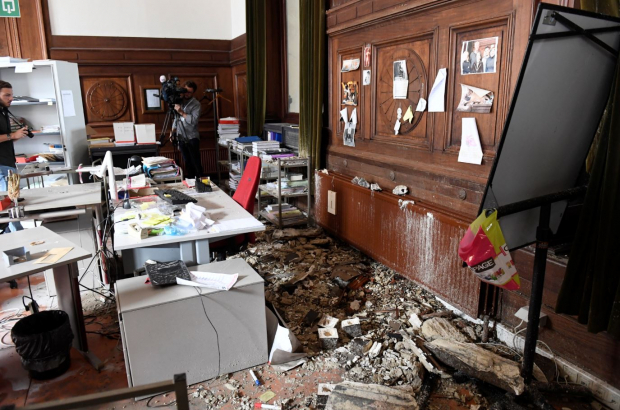 Proof, if it were needed, that Brussels' Justice Palace is in a state of disrepair came on Tuesday night when part of a ceiling collapsed, fortunately injuring nobody. The collapse occurred late at night in the courthouse registry, where criminal records are kept. The debris is considerable, but no documents have been damaged. Early reports suggest a leaking pipe caused the ceiling to cave in. Brussels mayor Philippe Close took to Twitter asking if "we really have to wait until 2040" for the Justice Palace's planned renovation to be completed. "I have asked the City of Brussels inspection department to evaluate the damage and the stability of the courthouse," Close added. The Justice Palace has been covered in its ubiquitous scaffolding for the past 32 years. Even the scaffolding itself needs replacing, but it cannot simply be removed because it includes supports that are holding the walls of the courthouse together. Exterior renovations are now scheduled to be completed by 2032. Works to the interior of the building will take longer and estimated to finish in 2040.